With a three months free trial, get up and running with zero risk. Flexible licensing allows you to scale up or down licenses as you need to. With full video tutorials covering both installation and usage the learning curve is short. Watch the videos on PCs, tablets or even a mobile device. From just €159 per month CrossTrack Material Tracking becomes your most cost-effective employee, with no lengthy tie-in period. Know both the location and life of your pre-preg rolls or tapes, and once they're cut track your kits until they are out of the autoclave. Easily transfer rolls, tapes and kits between locations using barcode or the option of RFID scanning for complete hands-off logging. Either drill down on screen or generate a PDF on a kit, roll, tape or entire batch. You can also write your own custom reports to output instantly to Excel. Associate files with material, batches and kits simply by dragging and dropping, so that staff have access to relevant documents from anywhere. Supports any file format. By adopting faster methods of data entry and pre-populating fields with defaults the possibility for errors is massively reduced. The entire CrossTrack philosophy is to make you self-sufficient rather than reliant on the vendor, with the software just working transparently in the background. CrossTrack Material Tracking uses the industry standard (and free) MS SQL Server Express database to provide live material location and life status for all connected users. 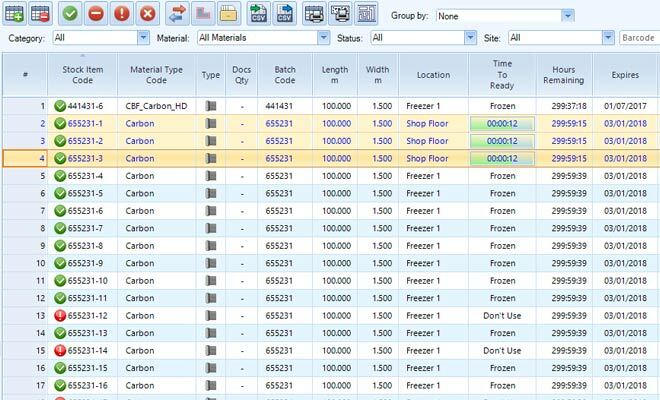 Visual countdowns show the thawing status of any materials, and icons give instant identification of usable material. Columns can be resized and dragged into your preferred order, and custom fields can be easily added. All settings are on a per-user basis, allowing each user to see the information that's important to them. CrossTrack also has comprehensive user-based permissions, allowing you to provide features to just the staff that need them. Simply register, download the software, request your 3-month free trial and get up and running with the online tutorials. If you decide not to continue just cancel your registration before the free trial period ends. Do you have seasonal busy periods? With CrossTrack Material Tracking's flexible subscription you can add or remove licenses between each subscription period as required. After your free three months take a subscription plan that suits your business. Pay quarterly or annually, from just €159 per month. Billing period is in advance. An invoice will be issued 30 days before the end of the three months free period. Payment is required to receive extension codes. What does CrossTrack Material Tracking do? It provides tracking of both material and material life of composite material rolls, tapes and kits. Many composite cutting companies still rely on paper-based track of material life and have no way to track location other than manual search. CrossTrack Material Tracking provides a simple and easy way not only to instantly see where your material is and its life status, but also to generate traceability reports, essentialy for the exacting standards of the aerospace industry. Companies of all shapes and sizes. CrossTrack Material Tracking is the entry level version of our enterprise composite manufacturing suite, and is aimed at smaller workshops, but even multi-national companies are interested in using it due to its SQL database, fast reporting and low cost. Simple: Complete the form below. We'll provide login details to the CrossTrack customer portal where you can download the software, installation documents and online tutorial videos. All software updates are included free of charge in the subscription fee. Online technical support is also provided free of charge. If you want us to take care of installation remotely a one-off fee of €299 is applicable. Q. Other solutions are much more expensive. How can you offer it at this price? By making the implementation process pain-free we reduce the cost of sale. Customers are self-serving, but with support when they need it. Q. Is there really no lengthy tie in? No. Once you complete initial registration you're free to use the software for three months. At the end of the second month we'll send an invoice, payable in 30 days. If you don't wish to continue using CrossTrack just let us know and we'll cancel the invoice. If, later on, you decide to start using it again just continue the subscription. Q. Can I upgrade to the full CrossTrack Suite, and what are the benefits? A. Yes, there is a full upgrade path.There are various versions of CrossTrack above the Material Tracking version, which offer features such as tight integration to nesting, allowing you to go from CAD file to NC code fully automatically. Other features include scheduling of jobs for machines, much more information relating to traceability, nesting around defects and tracking of life down to ply level. As CrossTrack Material Tracking uses the same MS SQL Server database structure and even the same installation routine as the full CrossTrack suite the process of upgrading is very straightforward. Note: It is strongly recommended that you upgrade your SQL Server Express database to a full SQL Server license at the same time as performing a CrossTrack upgrade to a higher version. Q. Does CrossTrack Material Tracking require the JETCAM Expert nesting software? A. No, CrossTrack Material Tracking is completely standalone. You can take advantage of JETCAM Expert's powerful nesting by upgrading to the full CrossTrack suite at a later stage. A. CrossTrack Material Tracking can run on Windows 7 or Windows 2008 R2 Server and above with .NET 3.5. Minimum RAM requirement is 4GB, with the application itself only requiring around 100MB of hard disc space. Both CrossTrack Material Tracking and SQL Server Express could be installed on the same PC or can connect to each other across a network. CrossTrack installs as a client/server application, but an instance of the client can run on the same PC as the server e.g. a single license system of CrossTrack can be contained on a single PC. An internet connection is mandatory on the CrossTrack server PC.